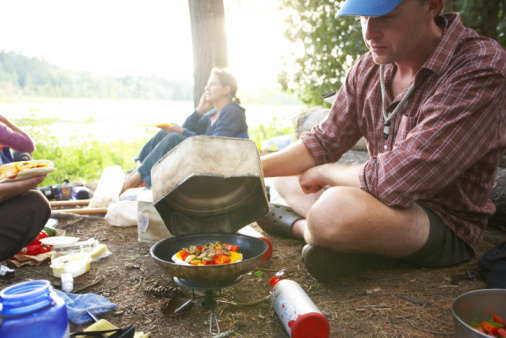 Coleman propane gas canisters are handy for camping. They are used to power outdoor cooktops and portable propane camping-lanterns. While these canisters are usually thrown away after being emptied, you can refill them using a 20 lb. propane tank. A special fitting connects the 20 lb. propane tank to the propane gas canister. Transport your 20 lb. propane tank into a temperature-controlled room and allow it time to adjust to room temperature. Place your Coleman propane gas canister in a freezer and allow it to chill for a period of 15 minutes. Screw your propane bottle refill-fitting onto your 20 lb. propane tank. Remove the Coleman gas canister from the freezer and screw it to the other end of the propane bottle's refill fitting. Invert the propane tank upside down. Open the valve on the propane tank and allow the small canister to fill. It is finished filling when you no longer hear the gas rushing into the canister. Close the valve on the propane tank and set the tank upright. Unscrew the Coleman propane canister.